When your code is writing data, and the editor is recording it, the Show data button is displayed in the simulator under the board and simulation controls. 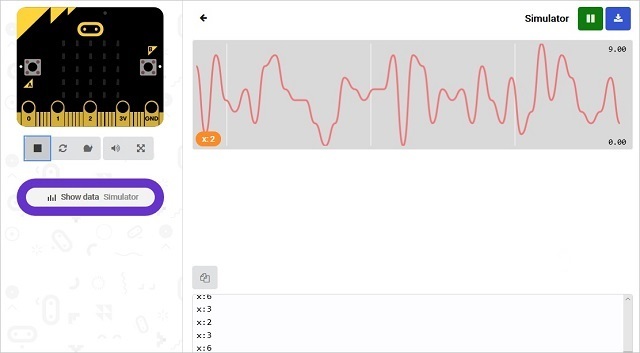 The console window under the graph will show the data in the format it was written. The chart is the visual representation of the values appearing on the console. The chart will display new data as it arrives. The chart will scroll with time to continue to display new values. The chart window shows the data view controls on top of the chart. Source: Tells you where the data is coming from. If the code writing the data is running in the simulator, then the source is Simulator. 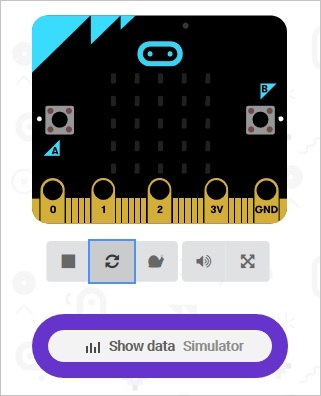 If your code is running on the micro:bit and connected by USB, the source is micro:bit. Pause: The pause button will stop the display of new values and stop scrolling. When you resume, the chart starts again with the current value written. Resume: The resume button will start displaying new values after the Pause button was pressed. Download: The download button collects the data your code has written and downloads it to your computer as a file called something like data-11-2018-23-00-0700.csv. The numbers in the filename are the date and time when the file is created. The file may automatically open in an editor or spreadsheet if one of those programs is associated with csv files.